Through the year Green Curtain put on a mixture of plays and readings. These are listed on our menu. The cast at the dress rehearsal for the first version of our first show Just Above Dogs. 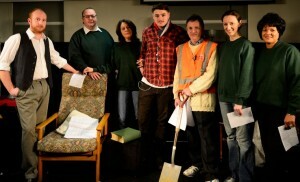 Kevin Bohan, Matt Lord, Brenda, Kieran Moriaty, Patrick, Rachel Swift and Debbie Krieger.